Robert Ahomka-Lindsay, Deputy Minister for Trade and Industry, has stressed the need for Ghanaians to patronise made-in-Ghana goods to reduce the country's heavy dependence on imports. New categories were International Wine of the Year, International Spirit of the Year, International Beer of the Year and New Beverage of the Year. Kasapreko's Storm Energy Drink was adjudged Product of the Year. Ernest Boateng, Chief Executive Officer (CEO) of Global Media Alliance, also expressed satisfaction with the participation of both public and beverage companies ahead of the event. Ghana Beverages Award 2018 was organized by Global Media Alliance in conjunction with Consumer Protection Agency, Food and Beverages Association of Ghana, Ghana Tourism Authority, National Drinking-Bar Operators Association and the Food and Research Institute of CSIR. Media sponsors included Daily Guide, Daily Graphic, Today Newspaper, Citi FM, Happy FM, YFM, Oman FM, LIVE FM, Starr FM, Kwese TV, Net 2 TV, GHOne TV and eTV Ghana. 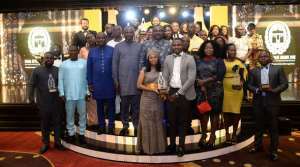 Award-winners included New Beverage of the Year – Kpoo Keke; Fruit Juice of the Year – Blue Skies; CSD Water of the Year – Coca Cola; International Spirit of the Year – Jameson; Beer of the year – Guinness; Bitters of the year – Alomo Bitters; Liqueur of the year- Kpoo Keke; Spirit of the year – Castle Bridge; Ciders/RTD of the year – Orijin Beer; Energy Drink of the year – Storm Energy; Cocoa/Chocolate /Dairy product of the Year- Vitamilk; Water of the Year – Bel Aqua; CSR Company of the year – Twellium Industries; International Beer of the Year – Heineken; Manufacturing company of the Year – Kasapreko Company Limited and Product of the Year – Storm Energy Drink.